Contemporary Venetian blinds with Ecowood and aluminium options are ideal for those that are sensitive to light. We provide customized colors to compliment your style and home décor. Get FREE installation & 5 year guarantee for some styles. Contact us for a free measurement & quote. Venetian blinds use horizontal slats which can swivel to control the amount of light through. These beautifully finished Contemporary Venetian blinds are available in an expansive range of painted, washed and stained stylish colours. 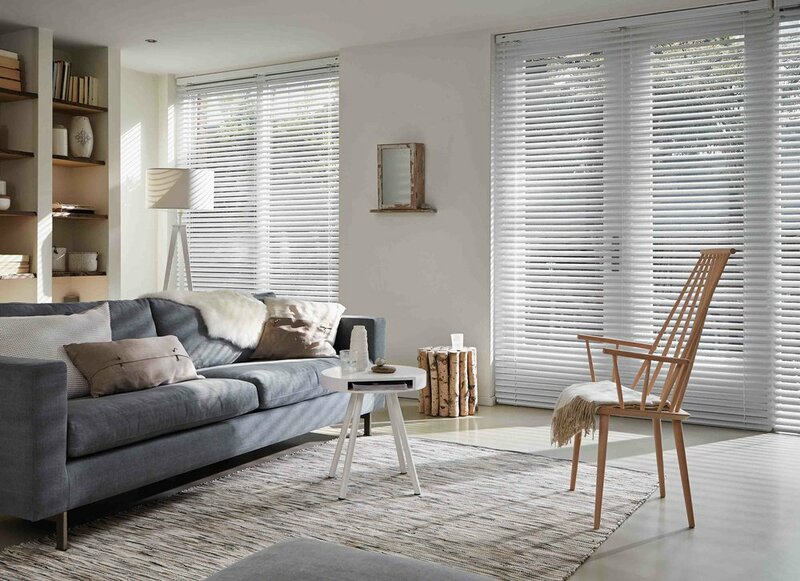 Our Contemporary Venetian blinds are available with either a routless slat or decorative tapes, and either option result in better light block, ideal for those that are sensitive to light. Made to measure these Venetian blinds are an affordable window dressing for any room. Venetian blinds have three material options which are perfect for your kitchen or bathroom. PVC Ecowood Venetian - perfect for bathrooms and kitchen as they won't warp or rot from the steam or heat. Available in either 50mm or 63mm slats. Aluminium Venetian - a more contemporary option which is also another cost effective waterproof solution for bathrooms and kitchens. Available in 25mm slimline or 50mm slats. Timber Venetian - a full timber option which adds style to any room. Available in 50mm, 60mm or 63mm slats. A child friendly safety option is available with a unique safety breakaway tassel that separates under pressure to ensure the safety of your family. Motorised options available with either a wall switch or remote control. Another child friendly option for venetian blinds. Colour matched to our range of Shutters for a stylish and continuous result through your home. Venetian blinds are perfect for bathrooms and kitchens.